Campaigners hoping to oust Thai Prime Minister Thaksin Shinawatra have demanded that he resign by next Sunday. The People's Alliance for Democracy, a coalition of anti-Thaksin groups, said if he ignored the ultimatum he could be forced from office by mass protests. Mr Thaksin has faced mounting calls for his resignation in recent weeks, causing him to dissolve parliament on Friday and announce a snap election. The three main opposition parties have decided to boycott the poll. Democrat Party leader Abhisit Vejjajiva made the announcement on Monday night, flanked by members of the Chart Thai and Mahachon parties. 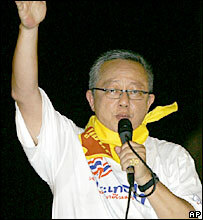 He said Mr Thaksin had refused to agree to their proposals for constitutional changes. "This means the government is not sincere about political reforms," Mr Abhisit is quoted as telling a news conference. "We give Thaksin until [Sunday] 5 March to resign or face the biggest show of opposition ever," Sondhi Limthongkul, a media tycoon who began the anti-Thaksin campaign, told supporters in the early hours of Tuesday morning. He was addressing a gathering in a large open area called Sanam Luang, near Bangkok's royal palace, which was the site of a huge rally on Sunday evening. The majority of demonstrators have now left the area, but supporters of Chamlong Srimuang, a former general who led a successful uprising against a military-led government in 1992, have said they will stay until Sunday. Analysts say Mr Thaksin's announcement of early elections is designed to quell the growing discontent amid various groups who have called for his resignation. Only a year ago his Thai Rak Thai party won 375 out of 500 seats in the general election. Before the opposition boycott was announced, he was widely expected to retain power in the April snap poll, but with a reduced majority. Mr Thaksin has faced calls to resign since late last year - calls which have grown since his family sold its stake in Shin Corp, the company he built up before he entered politics, last month. The sale, which netted the family members and others $1.9bn, has angered many urban Thais, who complained the family avoided paying tax and passed control of an important national asset to Singaporean investors. What do you think of the opposition parties' decision to boycott the elections? Will you be voting on 2 April? What issues are of concern to you? Send us your comments and experiences.